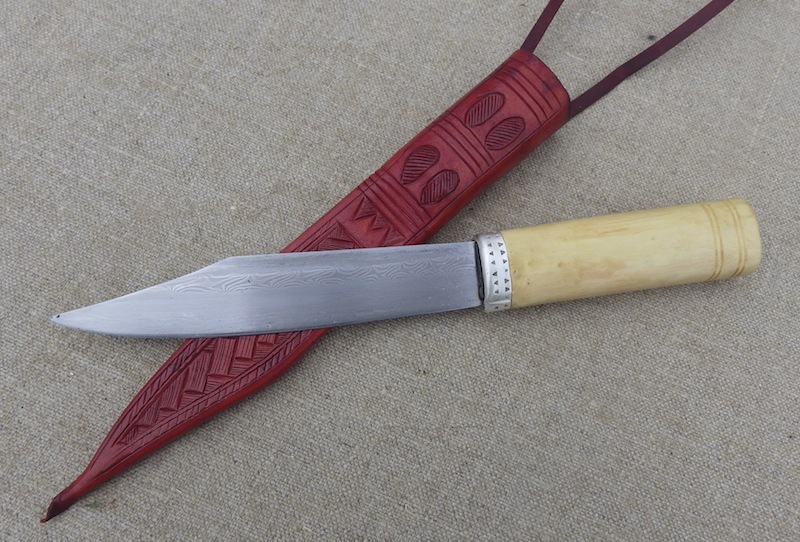 Here is a 12thC eating/utility knife based on pieces from MOL book Knives and Scabbards. By the 12thC pattern welding for swords had stopped, but it was still current for small knives. 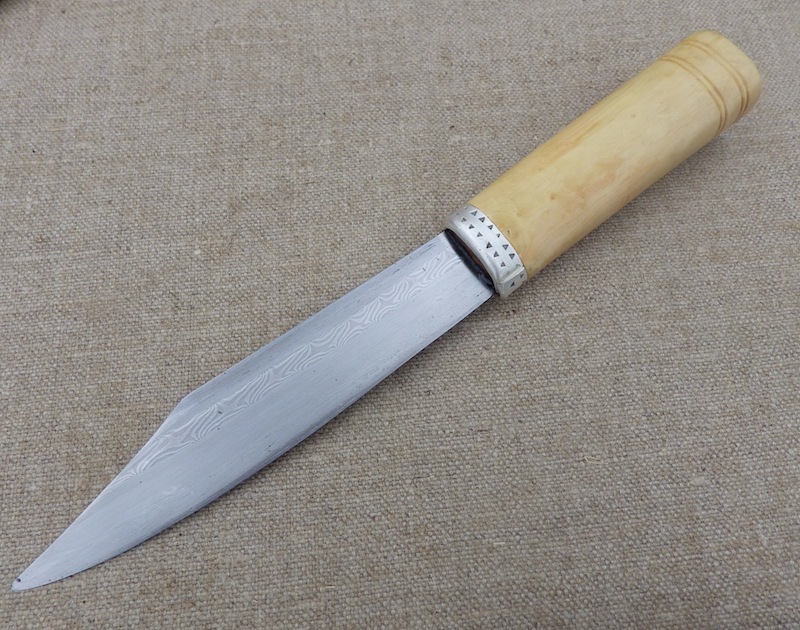 There is very little evidence for handles and so we went for a plain boxwood handle and as this required a little status, I included a silver ferrule. 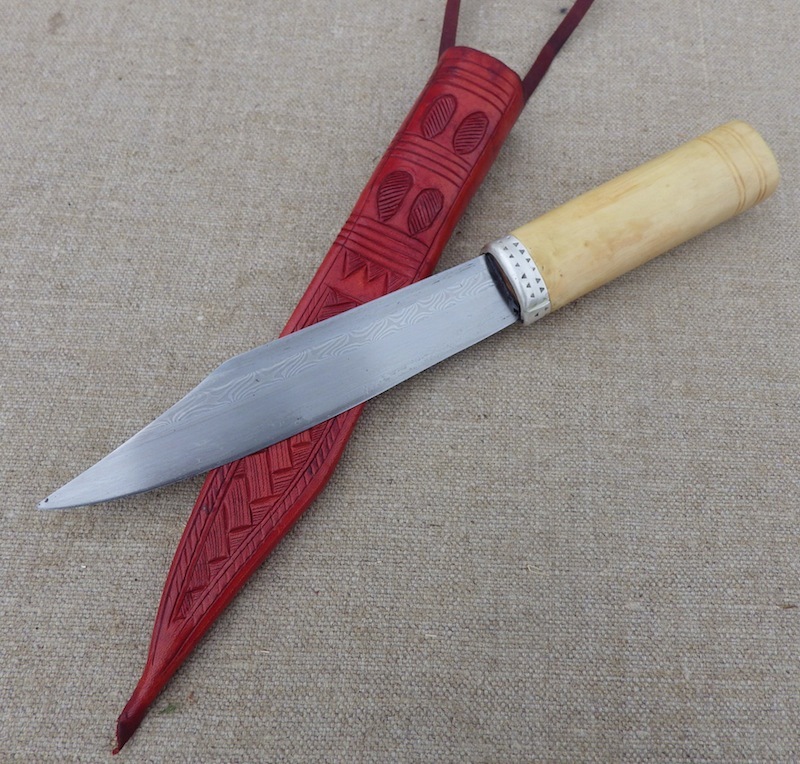 The blade is very much like a broken back seax, but three of the 7 blades shown in the book are of this form this seemed like a good solution. The only scabbard in the book shown as 12thC is in fact corrected in the addenda to 13thC. The decoration is very plausible for 12thC so we decided to make a scabbard without the tab and use this. Blade is by Owen Bush and has a twisted core with a wrought iron back and piled shear steel edge. Throughout the overall aim was historical authenticity and although this knife had to be full of conjecture I think we got there. See you at Canoefest 2013 in a field outside Market Harborough in 2 weeks? lovely. that silver ferrule is a very nice detail. I used the same sheath design for one I made earlier this year to go with blade #7. Curious why you didn't go with the tabbed sheath form though? Matthew, I didn't go with the tabbed form because it screams 13th and 14thC and the only reference I have found to it being 12th is in the MOL book, but the addenda at the back then list it with a corrected date of 13th, which I would agree with. So in a nutshell it is not a 12thC scabbard. Rats - Thanks to Matthew for correcting my mistakes, but it appears that there are a number of Dublin finds from the 12thC and before, that are tabbed. I will of course now go book shopping. The scabbard needed to be unarguably 12thC and so we went with an untabbed scabbard as that is what seemed safest. That's my baby! Can't wait to see it in my mailbox! 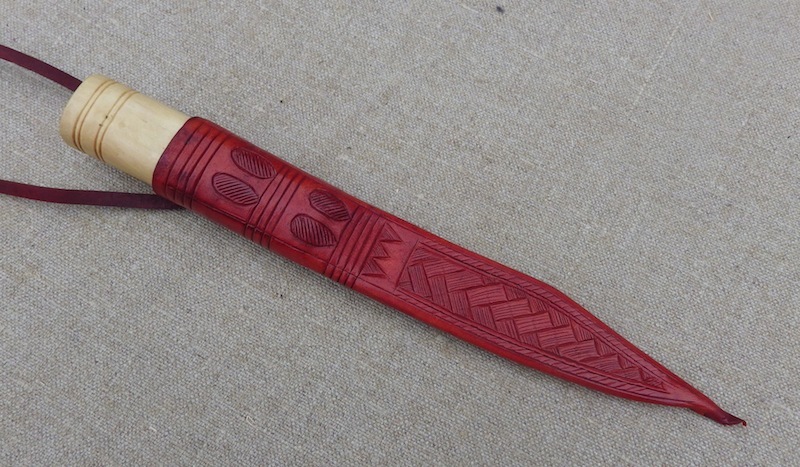 There is not a lot of information out there on 12th Century stuff, and I have to thank Tod for his diligence and research and experience in producing this knife. 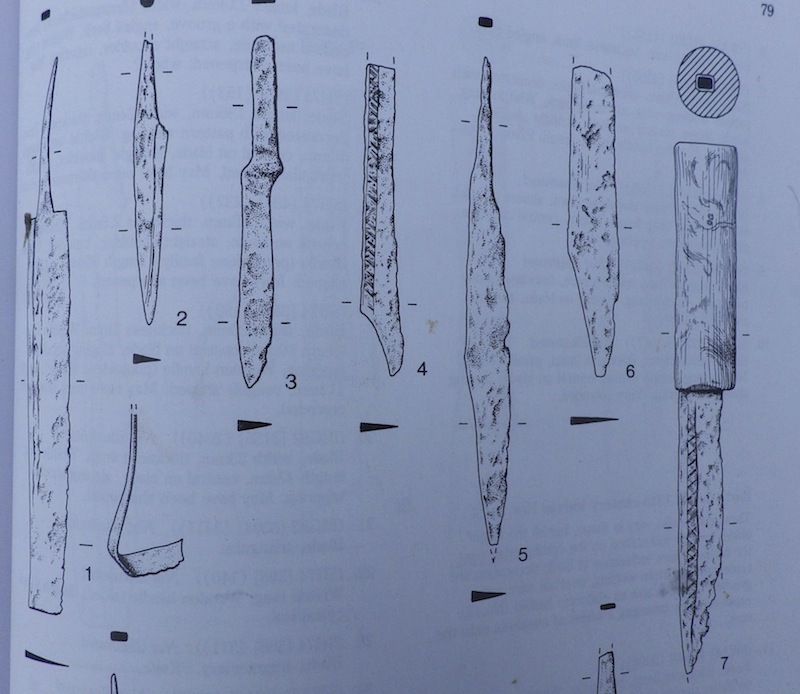 In the book Tod mentioned there are less than a dozen 12th C knives, and no 12th C scabbards. Not a lot of information with which to work - like everything else 12th C.
As I've already said to Tod, Esther Cameron's book on the sheaths and scabbards of Dublin contains plenty of information on 12th century sheaths, including ones of the form which the MoL decided to redate to the 13th, both with back seams and edge seams. This, combined with continental evidence, shows that the 'butterfly tabbed' sheath was in continuous use from the mid 11th to the late 13th. It may well have originated in Ireland and then spread eastwards from the busy trading port of Dublin. I post this not to detract from Tods work which is, as ever, outstanding, but just to clarify the situation concerning the sheath shown in the MoL book and it's appropriateness for a 12th century reconstruction (not least because I have recently made two and wouldn't want the recipients or anyone else to be under the impression that they were unsuitable for the period). The MoL redated it based on the context layer in which it was found and also because they were not aware that it was a form of sheath which was in use in the 12th century. The amount and state of preservation of leather finds from Dublin rivals (and exceeds) that of York and Cameron's book is an essential addition to the library of anyone interested in the study of sheaths and scabbards of the period. Thanks to Matthew for flagging this up. I was unaware of this book and that has now been remedied as I have one on the way. So to recap, the scabbard I made is structurally and artistically fine, but it could indeed have been tabbed and still be fine, where I assumed that it could not. 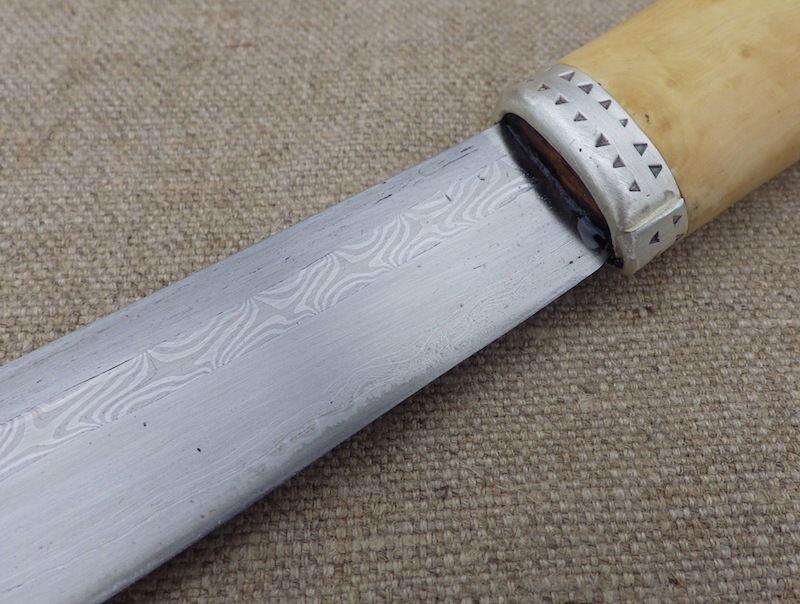 That aside, what is interesting is that the tabbing does not 'improve' the scabbard and in fact makes it harder to make, so that of course leaves the question as to why. I guess the answer is fashion. Langseax scabbards and seax scabbards towards the end of the Viking period were often tabbed, albeit in a structurally different way, so I wonder if this is a hangover from then. It also allows for an angled or horizontal rather than vertically hanging suspension and the utilisation of chain or trichonopoly. 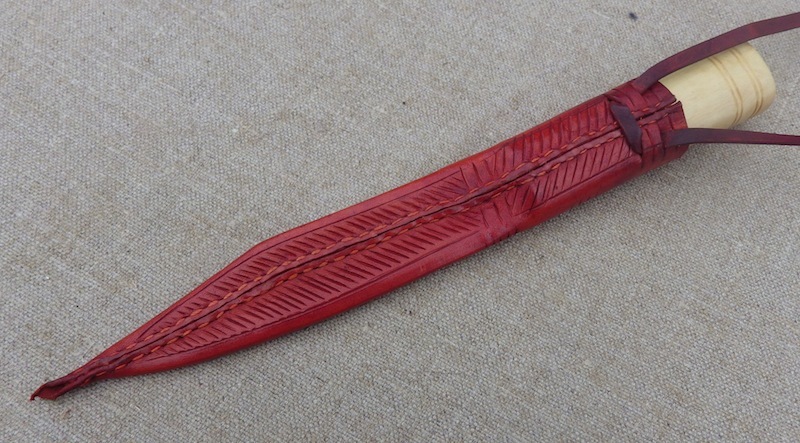 Many knife and seax sheath designs throughout the early medieval period in Western Europe featured some sort of tab. <edit> Mind you, looking at the MoL one, which is only apparently pierced in such a way as to preclude anything but a vertical suspension....dunno. That is odd. I'm going to go back and look at other examples now.